We've all seen photos of those gorgeous, vibrant green rice fields that seem to be never ending... we've dreamed of having that remote jungle getaway, somewhere in the middle of a peaceful paradise, immersed in the sounds of nature. 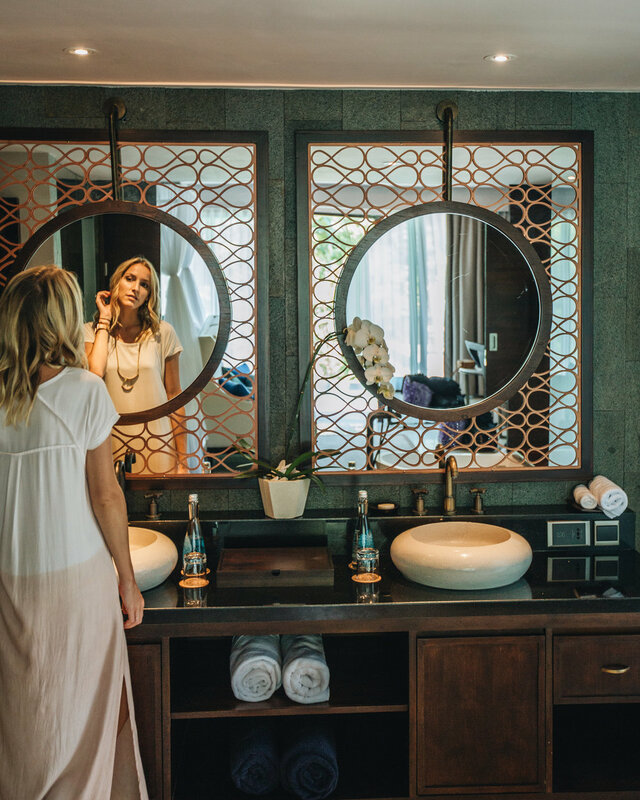 This getaway that we've all longed for can become a reality after traveling to one of Bali's most famous millennial mecca's-- Ubud. If you're anything like me, you might have been introduced to the island of Bali after watching Julia Roberts "find herself" in 'Eat Pray Love.' All I knew after seeing this film was that a. I needed to eat pasta and drink wine in Italy. ASAP, and b. wherever Bali was, I knew I had to go there to relax and experience this beautiful culture at some point in my life! Ubud is where most of the film took place in Bali, and has become such a famous destination for travelers from all over the world! And more recently, it has become especially popular among bloggers because there are endless photo opps with never-before-seen backdrops that will literally take your breath away. It's definitely one of those places that you have to see it to believe it, because as gorgeous as the photos may look, they don't even compare to what it looks like in real life! So now that I have hopefully convinced you ((as if you actually needed any convincing in the first place, ha!)) you absolutely have to make Bali, and more specifically Ubud a priority on your list of upcoming travels!! You will not regret it whatsoever, trust me. There are so many fun and unique things to do around the area of Ubud, but even if you just want to come and fully relax, and possibly not even leave your resort, ((hey, no judgement there!)) 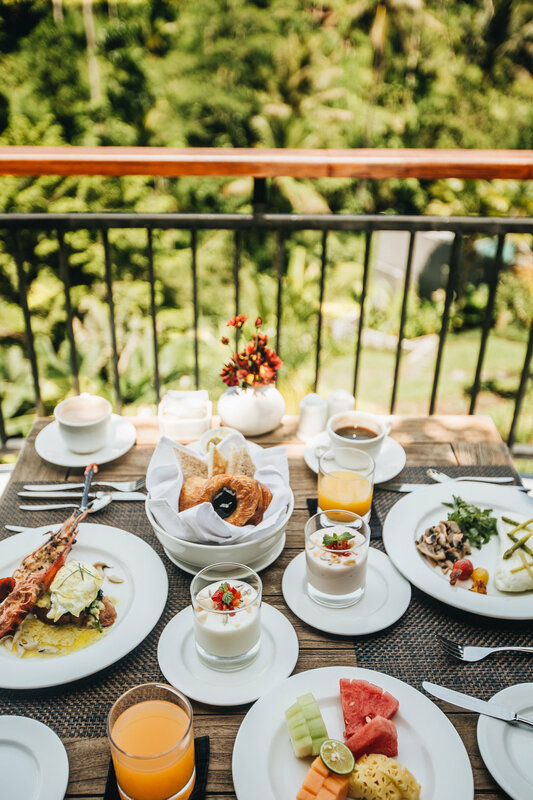 I have the perfect recommendation for where to stay: Samsara Ubud. It was pure magic the 2 nights and 3 days Zach and I were there, and I could not recommend it more highly! We rode our motorbike to the resort, and the drive itself was absolutely beautiful. The resort is kind of out in the middle of nowhere, which we have found makes for an even more relaxing experience. Samsara is actually located in the middle of the jungle, surrounded by lush palm trees and greenery everywhere you turn, with those magical jungle sounds that seem like they are straight from one of those playlists that are meant to put you right to sleep, ha. The lobby itself was stunning and had such beautiful interiors with blue accents, and after riding a golf cart down to our villa, our room was decorated with a similar vibe. Blue is always a win for me, so I was in heaven from the start!! From the throw pillows, to the patterned robes, there was an obvious attention to detail in every aspect of our villa that I couldn't help but appreciate. Our room was the kind of beautiful oasis that you don't ever want to leave, so we spent a ton of time relaxing at our private pool ((which was heated btw)) and in our room. Sometimes we find it hard to relax when we travel because for us, traveling is our work and it's hard to get out of work mode, but Samsara made relaxing a piece of cake. Our infinity pool looked out onto hundreds of palm trees and the only sounds you could hear was the running water from our pool. It was actual paradise and I cannot wait to go back sometime! In my opinion, something that can either make or break a trip is how friendly the staff is at a resort. It is the worst when you are staying at a gorgeous place, but the people you constantly come in contact with are either rude or unhelpful. At Samsara this was the complete opposite! We arrived here on my birthday and used the trip as a bit of a birthday celebration for me! Our butler Harry who was the one who first drove us down to our room on the golf cart, was probably the sweetest person in the entire world. When he found out it was my birthday, he put together a 1-minute video of each and every staff member telling me, "Happy Birthday Tara!" It was totally unexpected, completely above and beyond, and just so, so sweet. My birthday was going great, but I was missing being with friends and family on this day. Harry made me feel right at home and celebrated! It meant the world to me and I had no idea how to possibly thank him enough! Harry's video is just one example to prove how genuinely kind the staff of Samsara was to us, and they made our stay in Ubud that much sweeter because of it! 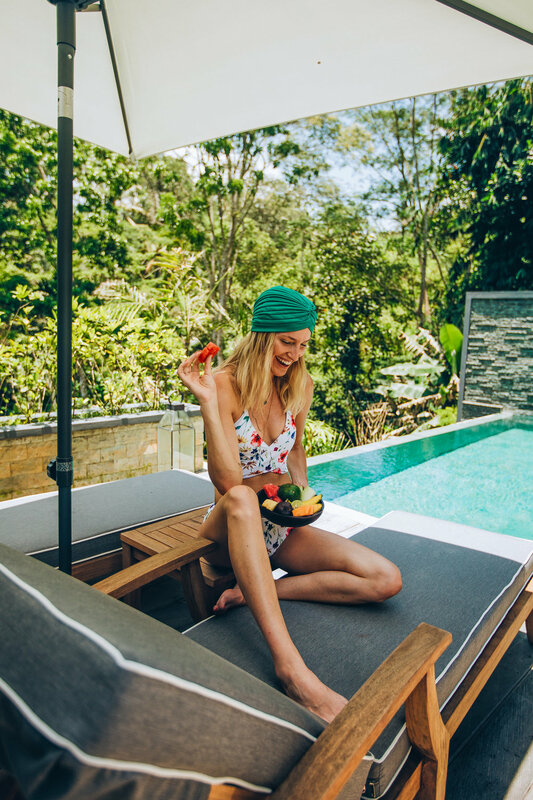 From the location to the staff, the major pool goals to the food, Samsara was the perfect place for a remote getaway in Ubud! I'll be sharing some of my most favorite photos from our trip below for you guys to see! And as always, if you have any questions about our stay or how to book a trip here, do not hesitate to ask!! Check out the Samsara Ubud website here for booking details and even more gorgeous photos! Life Update: Photoshoots, Kuala Lumpur, The Gili Islands + more!